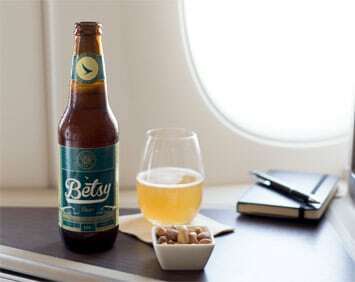 In a nice marketing initiative, Cathay Pacific has introduced Betsy Beer – the world’s first hand-crafted bottled beer brewed to be enjoyed at 35,000ft. “The quality of the inflight dining experience has always been an important focus for Cathay Pacific – the airline has long sought collaborations with renowned partners, restaurants and chefs in order to provide its customers with innovative dishes and beverages as part of its philosophy of a Life Well Travelled. “To that end, Hong Kong’s home carrier is delighted today to announce the launch of Betsy Beer, the world’s first hand-crafted bottled beer specially brewed to be enjoyed at 35,000 feet.” says the press release. Named after “Betsy”, Cathay Pacific’s first aircraft, a Douglas DC-3 which flew passengers around the region in the 1940s and 1950s, Betsy Beer will be first served to First and Business Class passengers onboard flights between Hong Kong and destinations in the UK – Heathrow, Gatwick and Manchester – from 1 March until 30 April 2017. It isn’t a secret that cabin pressure and altitude affects passengers’ taste buds, but by using a combination of science and traditional brewing methods, Betsy Beer, which Cathay Pacific has produced in harness with Hong Kong Beer Co, is created with a combination of Hong Kong and UK-sourced ingredients, aroma and necessary carbonation to taste great both in the air and on the ground. The inclusion of “Dragon Eye” fruit is a unique characteristic of the beverage. Known for its aromatic properties, the fruit adds to the round, rich, textural properties that make the beer distinctive. This flavour is enhanced further by the inclusion of a small component of New Territories’-sourced honey in the brewing process, giving the beer agreeable floral notes, while the use of Fuggle, a revered hop and a mainstay of traditional British craft ales, lends it a pleasingly earthy and full-bodied flavour.